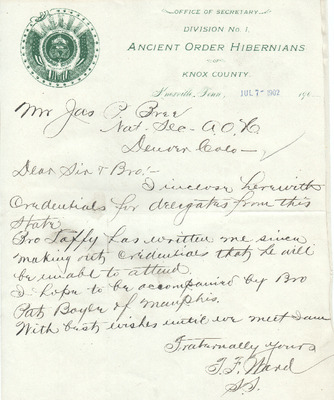 Correspondence from 1902-1904 to James P. Bree, the National Secretary of the Ancient Order of Hibernians, New Haven, Connecticut. 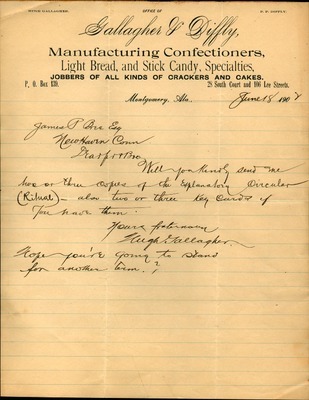 The correspondence, concerning Alabama AOH business, includes letters primarily from Hugh Gallagher, on Office of Gallagher & Diffly, Manufacturing Confectioners, Montgomery, Ala. stationery, and also from Hugh Lynch and Pat McCarron from Pratt City Alabama. A few of the letters are undated. 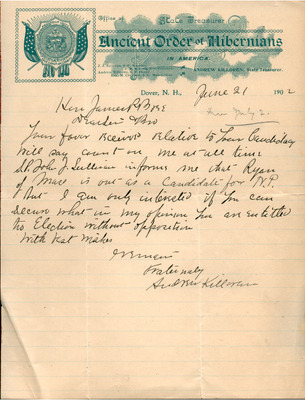 Correspondence from 1904 to James E. Dolan, the National President of the Ancient Order of Hibernians, Syracuse, New York. 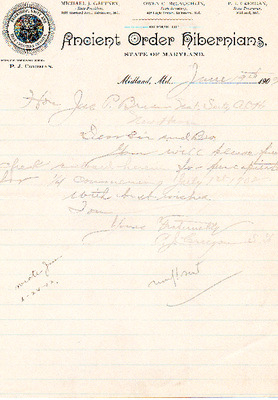 The correspondence, from Tucson, Arizona was written in April, 1904. 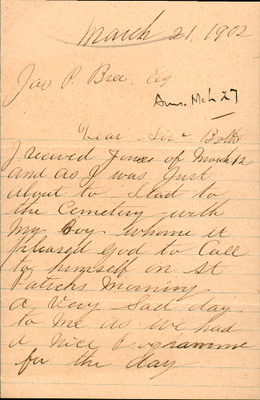 Correspondence from 1902 to James P. Bree, the National Secretary of the Ancient Order of Hibernians, New Haven, Connecticut. 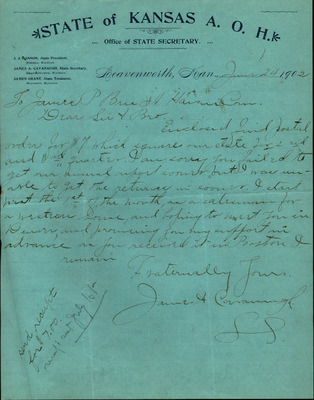 The correspondence, concerning Arkansas AOH business, includes a letter from Fort Smith. 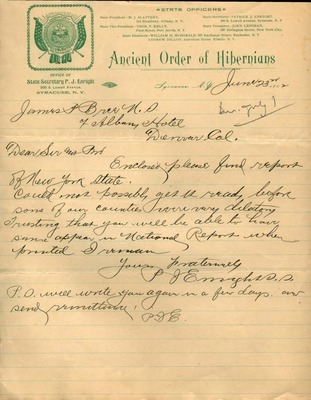 Correspondence from 1902-1904 to James P. Bree, the National Secretary of the Ancient Order of Hibernians, New Haven, Connecticut. The correspondence, concerning California AOH business, includes letters from cities across the state including Oakland, San Jose, Sunnyville, and others. 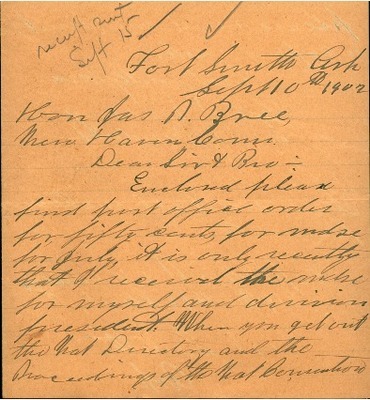 Correspondence from 1902-1904 to James P. Bree, the National Secretary of the Ancient Order of Hibernians, New Haven, Connecticut. 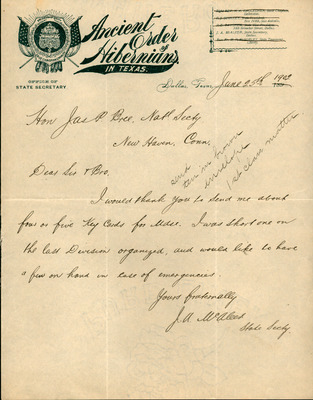 The correspondence, concerning Colorado AOH business, includes letters from all over the state including Denver, Pueblo, Leadville, and a host of other cities. A collection of documents dating back to 1882 including correspondence from to James P. Bree, the National Secretary of the Ancient Order of Hibernians, New Haven, Connecticut. 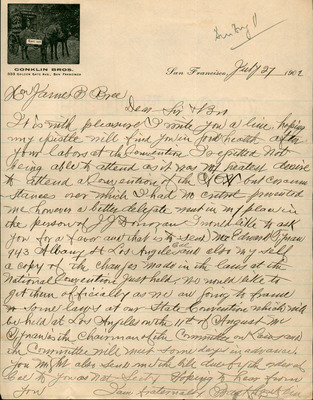 The correspondence, concerning Connecticut AOH business, includes letters from cities across the state including New Haven, Danbury, Hartford, Fairfield, and many others. 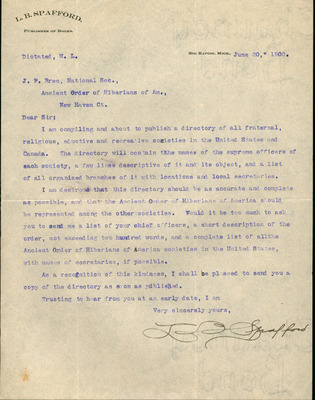 Correspondence from 1902-1906 to James P. Bree, the National Secretary of the Ancient Order of Hibernians, New Haven, Connecticut. 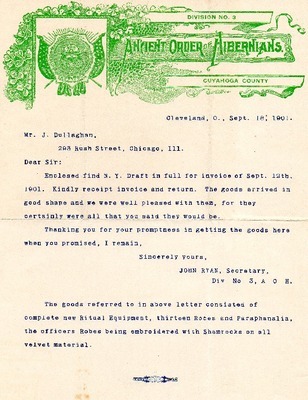 The correspondence, concerning Delaware AOH business, includes letters primarily from Wilmington, DE, on State Board of Anciend Order of Hibernians of Delaware stationery. 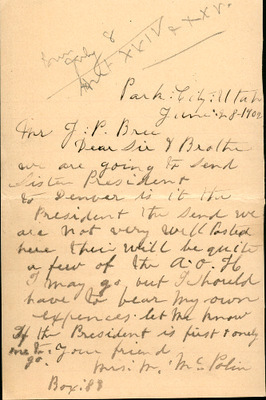 Correspondence from 1903 to James P. Bree, the National Secretary of the Ancient Order of Hibernians, New Haven, Connecticut. The correspondence, concerning Florida AOH business, includes 2 letters from the same author written in Pensacola. One of those letters is undated. 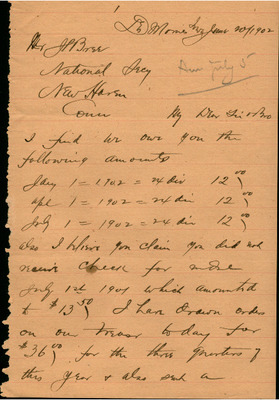 Correspondence from 1902-1904 to James P. Bree, the National Secretary of the Ancient Order of Hibernians, New Haven, Connecticut. 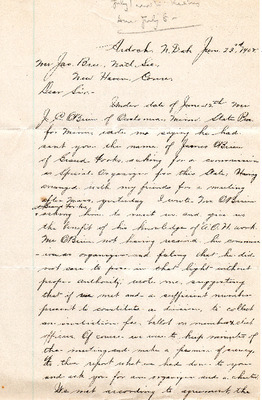 The correspondence, concerning Georgia AOH business, includes letters from across the state, but a large contingent comes from J.P. O'Connor who wrote from his own law office in Savannah. 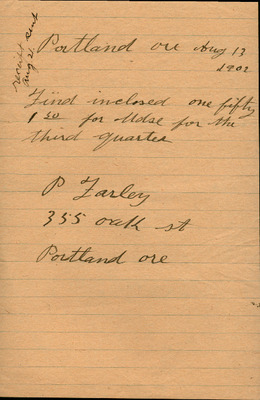 Correspondence from 1904 to James P. Bree, the National Secretary of the Ancient Order of Hibernians, New Haven, Connecticut. 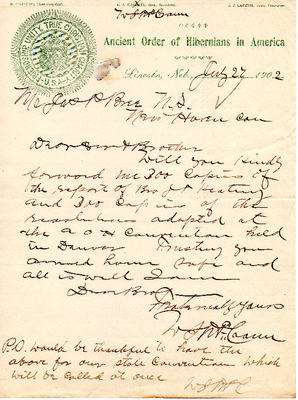 The correspondence, concerning Hawaii AOH business, includes two letters from F.D. Creedon, County President who wrote from Honolulu. 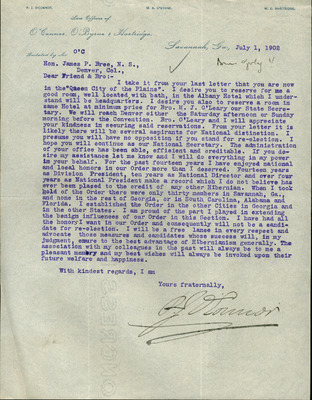 Correspondence from 1901-1906 to James P. Bree, the National Secretary of the Ancient Order of Hibernians, New Haven, Connecticut. 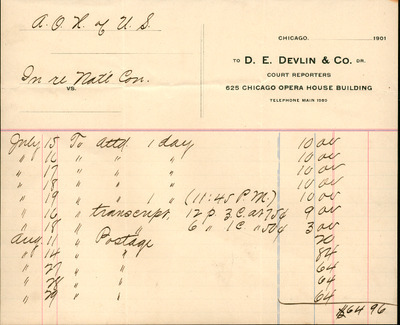 The correspondence, concerning Illinois AOH business, includes a wide array of letters from across the state, but primarily written in Bloomington and Chicago. 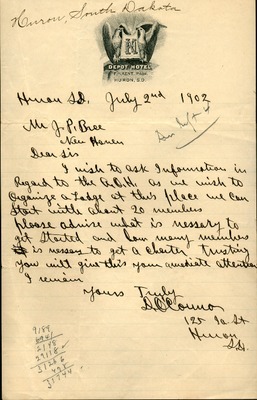 Correspondence from 1902-1906 to James P. Bree, the National Secretary of the Ancient Order of Hibernians, New Haven, Connecticut. 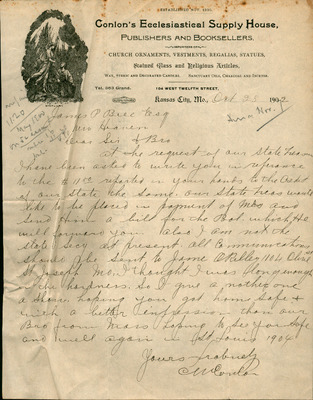 The correspondence, concerning Indiana AOH business, includes letters from a diverse collection of cities and towns from all over the state. A few of the letters are undated. 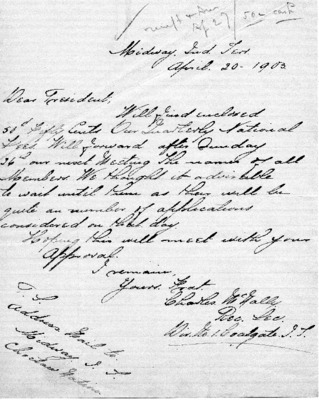 Correspondence from 1902-1904 to James P. Bree, the National Secretary of the Ancient Order of Hibernians, New Haven, Connecticut. 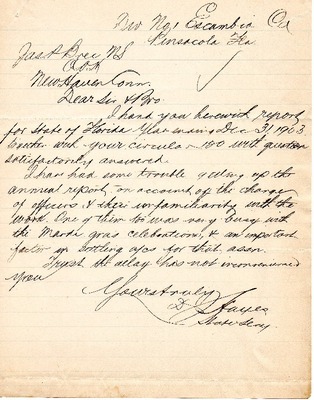 The correspondence, concerning Iowa AOH business, includes letters primarily from Des Moines. 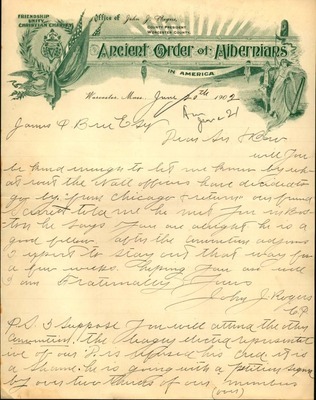 Correspondence from 1902-1904 to James P. Bree, the National Secretary of the Ancient Order of Hibernians, New Haven, Connecticut. The correspondence, concerning Kansas AOH business, includes letters primarily from the offices of the State Treasurer and State Secretary in cities including Kansas City, Winfield, Leavenworth, and Pittsburg. 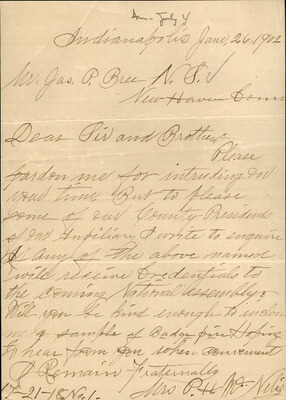 Correspondence from 1902-1904 to James P. Bree, the National Secretary of the Ancient Order of Hibernians, New Haven, Connecticut. 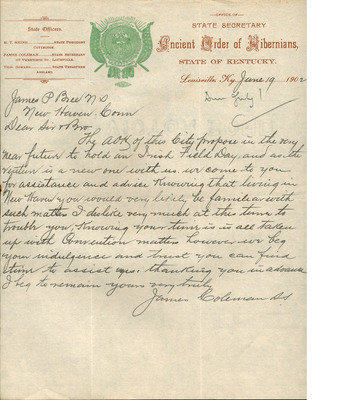 The correspondence, concerning Kentucky AOH business, includes letters primarily from the State AOH offices and the Jefferson County AOH offices. 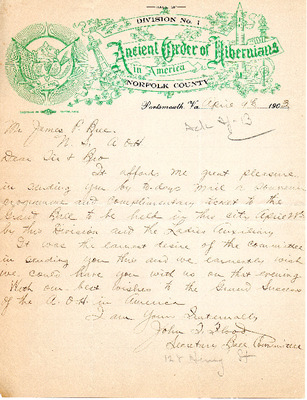 Correspondence from 1902-1904 to James P. Bree, the National Secretary of the Ancient Order of Hibernians, New Haven, Connecticut. 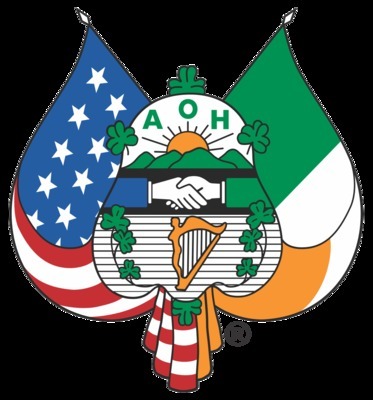 The correspondence, concerning Louisiana AOH business, includes letters from AOH officers based exclusively in New Orleans. 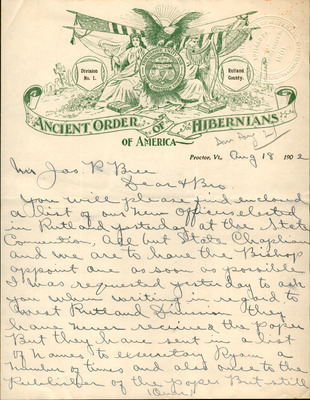 Correspondence from 1902-1906 to James P. Bree, the National Secretary of the Ancient Order of Hibernians, New Haven, Connecticut. 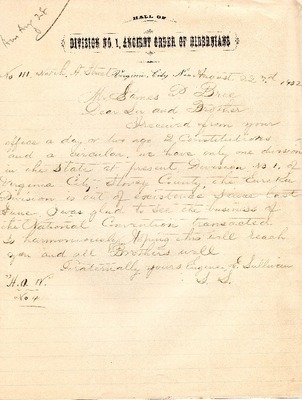 The correspondence, concerning Maine AOH business, includes letters from Portland, Bangor, Biddleford, and Lewiston. 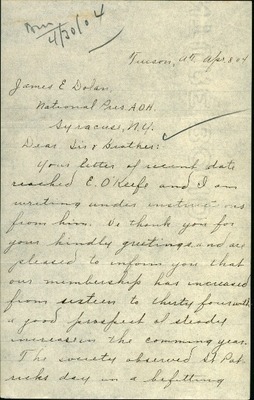 Correspondence from 1902-1904 to James P. Bree, the National Secretary of the Ancient Order of Hibernians, New Haven, Connecticut. 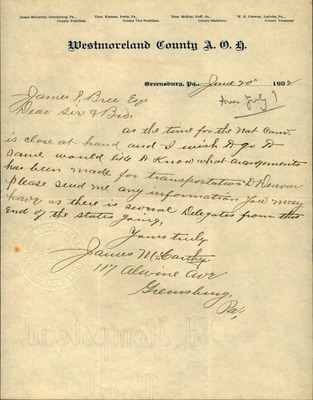 The correspondence, concerning Maryland AOH business, includes letters primarily from AOH officers. While most letters are written from Baltimore, Maryland's Recording Secretary, M.J. Creegan, wrote from Midland. 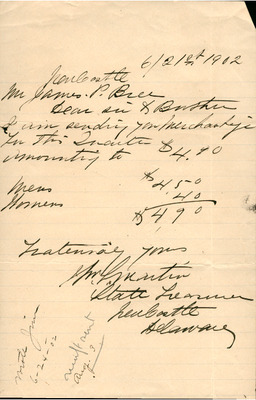 Correspondence from 1902-1906 to James P. Bree, the National Secretary of the Ancient Order of Hibernians, New Haven, Connecticut. 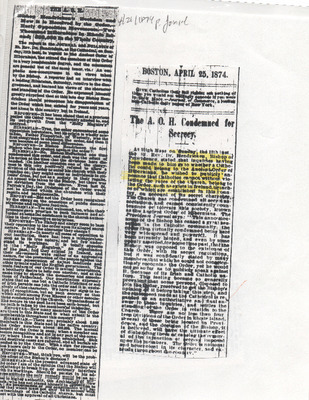 The correspondence, concerning Massachusetts AOH business, includes letters from across the state in many different cities including Boston, Worcester, Clinton, and many others. 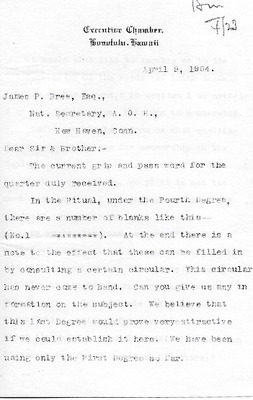 Correspondence from 1902-1907 to James P. Bree, the National Secretary of the Ancient Order of Hibernians, New Haven, Connecticut. 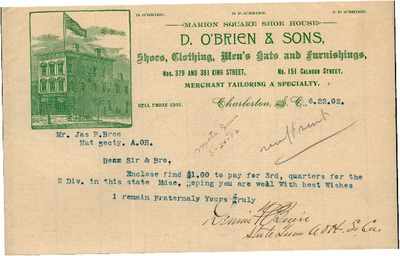 The correspondence, concerning Michigan AOH business, includes letters primarily from a Mr. Powers, on Powers-Tyson Printing Co. Pearl Street Bridge, Grand Rapids Michigan stationery and letters from several other cities. Correspondence from 1902-1904 to James P. Bree, the National Secretary of the Ancient Order of Hibernians, New Haven, Connecticut. 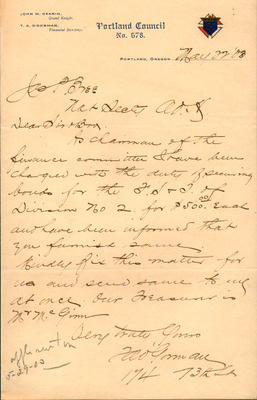 The correspondence, concerning Minnesota AOH business, includes letters from WM. B. Joyce of St. Paul and other members as well. A few of the letters are undated. 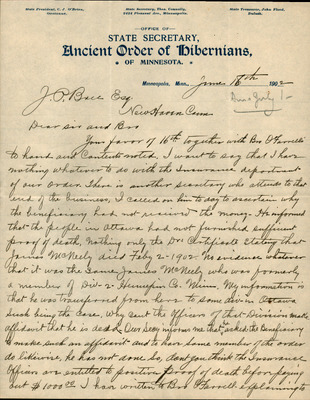 Correspondence from 1902-1904 to James P. Bree, the National Secretary of the Ancient Order of Hibernians, New Haven, Connecticut. The correspondence, concerning Missouri AOH business, includes letters from St. Louis, Kansas City, and St. Joseph, Missouri. 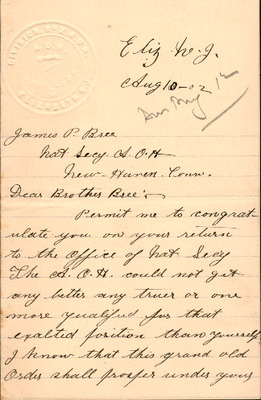 Correspondence from 1902-1904 to James P. Bree, the National Secretary of the Ancient Order of Hibernians, New Haven, Connecticut. 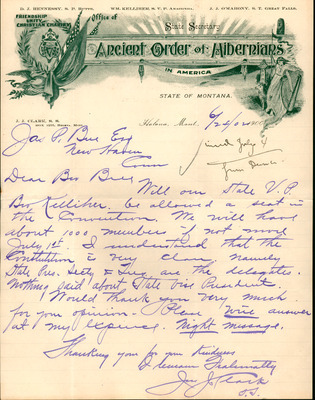 The correspondence, concerning Montana AOH business, includes letters primarily from Butte and Helena, Montana written by AOH state officers.